As well as light breakfast, lunches, snacks, cakes and coffee. We offer a ceramic painting service. 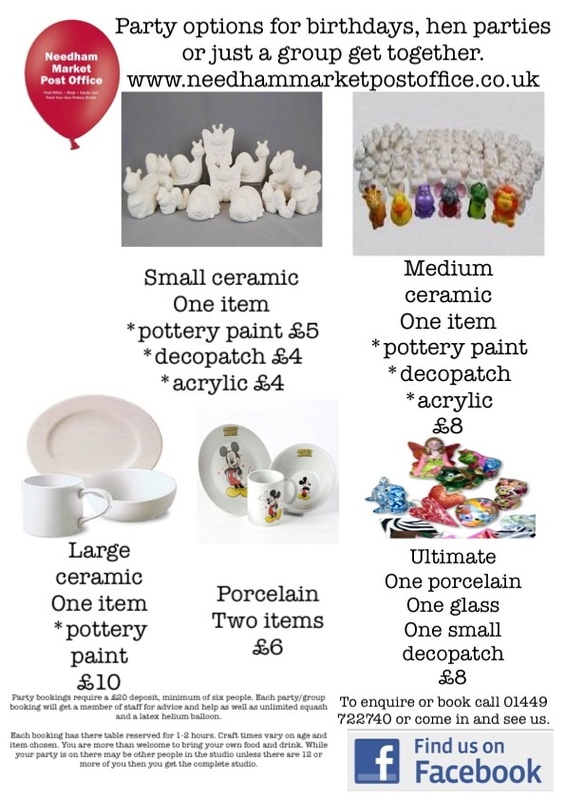 Both adults and children can enjoy painting their own mugs, plates, vases, dishes, tiles and keepsakes. We have a varied selection of each of these items to ensure we have something for everyone, no matter your age or personal taste. We don't add on a studio fee and Needham Market has free parking. Free high street parking for one hour, plus free all day parking in main carpark. Regular buses and trains from bury and Ipswich. Items you can expect to paint at our studio include: - Cups, Mugs & Teapots - Plates, Platters and dishes - Ornaments, Keepsakes & Moneyboxes - Vases, Oil Burners & Pots - Animals and Dinosaurs - Cars, Robots & Skateboards - Candleholders & Picture Frames and much more! To keep things fresh, we always like to update our stock. We don't want you to get bored of seeing and painting the same things so if you are a regular visitor to our studio, you'll know that we continually like to add new items to see how our customers like them. For example, during festive periods we will have a selection of Christmas items, or romantic items around St. Valentine's Day. We offer a great creative setting. You can paint an item how ever you like. Just one off, in a group or even in your own home.